Contemporary Colonial with million dollar views. This gem sits just outside the city limits with rare frontage along a stunning Par 5. Built with maintenance free living in mind. Brick and vinyl exterior, 3 car garage, blacktop drive, security system, Arxx Insulated concrete walls, hardwood and tile flooring along with a 2nd kitchen in a fully finished walkout basement. Basement features also include sauna, game room, large bedroom with 9 ft ceiling and lighted soffit, rec room with custom built ins, and surround sound for watching the game on Sunday. Take in the panoramic views from any room. Sip cocktails in the evening on your screened in porch, or lounge on one of 3 trex decks. Nothing missing from this home except you. 177 ft. of frontage on all-sport Big Lake. 4070 sq. 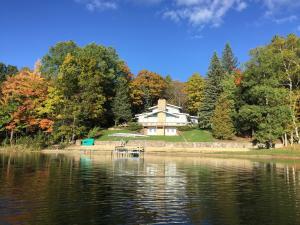 ft. home with a commanding view from the prime location on the lake. A rare opportunity given the width of the cleared area; current regulations prevent duplication. Incredible views from the enormous great room with access to an elevated redwood deck. A gentle slope leads down to a big sandy beach & sandy-bottom lake. 2 master bedroom suites, each has access to the deck. Aluminum Dock & boat-lift conveys with sale. 120 ac. Big Lake is clean & deep (80'). 13 species of fish includes walleye, bass, & pike. 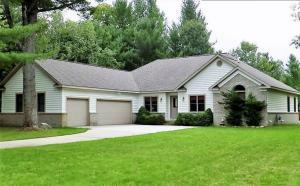 Only 6 miles from Exit 279 & Gaylord's up and coming Main St. Treetops & the Otsego Club are also nearby. Personal property is also available with exception of the pontoon boat. Check-out the drone video: https://goo.gl/voVskp. 53+ acre estate. 2-story brick, stone, & vinyl in excellent condition, including a 2015 roof on the house. 5358 sqft home + unheated Sun Room & Bonus Room. 4K sqft Pole Barn with big heated workshop & new roof in '17. Barn has 11.5' & 10' sidewalls & 4 big doors; tallest is 11'9''. Horse Stables & Paddock. Zoned AR: 31 acres hardwoods, 2 fields total 18 acres; including 2.3 ac. garden, & 4 acres of residential grounds - landscaped for easy maintenance. Comes w/generator & natural gas. Setup for rifle & bow hunting, great stand of hardwoods. Farm Equip. also avail. Unbranded Drone Video: https://goo.gl/f73M6t. 3D virtual tour: https://goo.gl/AkpXfB. Click to move through house. Icons in bottom-left of screen provide a floorplan view for each story plus a ''dollhouse view''. This gorgeous waterfront ranch has 183 ft of frontage and one of the BEST views on All-Sports Big Lake. Westward facing windows across the front of whole house. Each evening catch a different color sunset. 2 car attached garage, vaulted shed that sits on a cement pad, offers plenty of storage & possibilities. Build a mother in law suite on the combined lot. 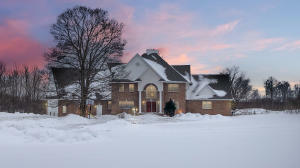 This immaculately kept home features fireplaces with inserts in both the great room and master suite. You are steps from the lake with walkout access from any room! Vaulted ceilings and prow front windows make the home feel light and airy. The loft upstairs is perfect for a quiet getaway, currently used as an art studio, but plenty of room for a futon or bed. This home has it all. Executive home at The Loon Golf Course. 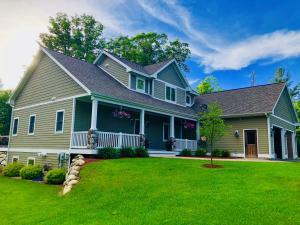 Home is positioned along a lush, Par 3 fairway and is the sole home occupying the end of a large cul-de-sac. Features include vaulted ceilings, fireplace with insert, arched transom window to allow plenty of sunshine, oversized deck along back of the house, main floor laundry, and attached heated garage. The gourmet kitchen has wraparound bar with custom cherry and cream cabinetry. Brand new stainless steel appliances including front loading washer and dryer round out the custom touches. Enjoy a drink on the covered front porch, or light the grill from the fabulous deck that runs the length of the home. The open concept kitchen/dining/living room spills over to the deck and large backyard making this the perfect spot for entertaining. 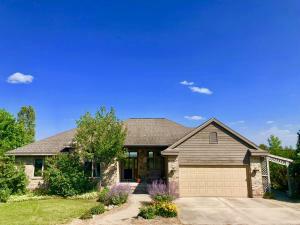 Big ranch located in one of Gaylord's most desired neighborhoods. Meadowbrook Farms is 2 mi north of the high school & just 3 mi to Main St. 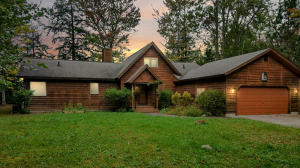 Awesome setting; both stories have commanding 4+ mi views of the Sturgeon River Valley & Treetops North. Great floorplan in pristine condition; including kitchen nook, split bedrooms, great room, & lower-level walk-out. Granite counters, hickory cabinets, maple floor. Lower-Level provides a family room w/wet bar, office, & game room. 24 x 24 frame-built extra garage. 5-Zone hot water heat boiler; new in 2016. 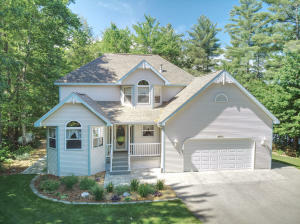 Checkout the 3D Virtual tour: https://goo.gl/6f3e9D. Click to move through the house. Icons in bottom-left of screen provide a floorplan view plus a ''dollhouse'' view'. Not all rooms are in virtual tour. BIG LAKE OVER 300 FEET OF FRONTAGE - Want water and land, this is the ONE! 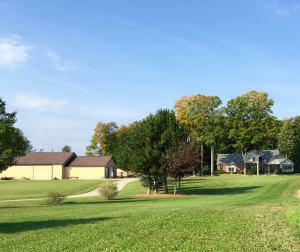 Property offers acreage, path to lakefront with dock and recreation area. This 3-4 bedroom. 3 bath home features Sun Room, large deck , walkout lower level, open loft and huge garage with Bonus room above. Many updates include hardwood floors, Knotty PIne ceilings, new carpet, windows, door walls and fresh paint. Home also features NEW furnace in 2017 with Heat Pump, ( has piping in place for Outdoor Wood Boiler) & water heater. 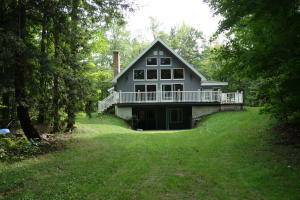 This property is one of kind on Big Lake, don't miss your chance to own it! 120 ac. Big Lake is clean & deep (80'). 13 species of fish includes walleye, bass, & pike. Treetops & the Otsego Club are also nearby. Call today for your showing. Osprey Model @ Hawks Landing. Energy Star Home w/4 yr. warranty. Spec. sheet is full of quality features. All upgrades and handicap features are available. Great location, very close to town in quiet desired area yet low township taxes. Fast Internet included in Dues. Optional property mgt. services. Building costs change over time. Final price to be established by quoting Builder prior to purchase agreement execution. Current price is Developer's best estimate given current Hawks' spec. sheet found on website. Listing Agent is member of LLC that owns this property.